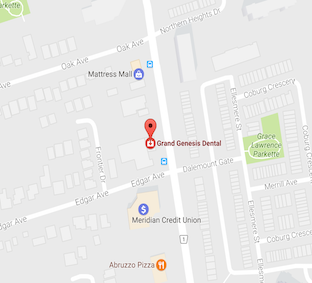 We are pleased to announce our Grand Genesis family dentistry is open for business. We’re looking forward to serving our Richmond Hill family dentistry patients and making sure they have a clean bill of oral health that lasts for a lifetime. The excellent combination of experienced dentists, friendly staff, innovative techniques and an excellent location is everything you’ll need for complete dental care for everyone regardless of their age. You’ll find all that here. We provide all of the latest innovative technologies like digital x-rays, in office crowns that are computerized and often only take one visit, and the minimal pain injection of Dental Vibe to name just a few. A welcoming atmosphere for Richmond Hill patients of every age is another advantage offered here. Whether you need cosmetic dentistry in Grand Genesis or restorative services, we are always available with the very best in dental advice, care and/or education. We are only too happy to walk you through other procedures like root canal so you have a solid understanding before the work gets done. We are committed to making sure you change the way you think about how general dentist operates. It’s our mission to provide state-of-the-art grand Genesis Dental services in a comfortable and professional environment. Our staff takes great pride in focusing on different types of dentistry and our panoramic x-rays actually reduce radiation while giving a clear picture of current and impending issues. It’s important to us that our Grand Genesis general dentistry practice becomes part of your team effort to prevent dental issues. That’s why we’re big believers in preventative dentistry routines and checkups. An ounce of prevention is worth a gram of cure as far as we are concerned and our dental hygienists are always ready to help you stay ahead of the plaque and calculus that can cause problems down the road. Supplying Grand Genesis dentistry for the whole family is important and it’s a responsibility we take seriously. Getting the best dental practice in Grand Genesis to help you no matter what stage of life you’re at is our goal. Keep in mind that along with everything else we offer, we have a convenient location with ample parking to best serve our valued Richmond Hill family dentistry patients. Getting in touch with us is easy and convenient. Why not start your family off on the path that will lead to beautiful bright smiles that last them for their entire lives today?